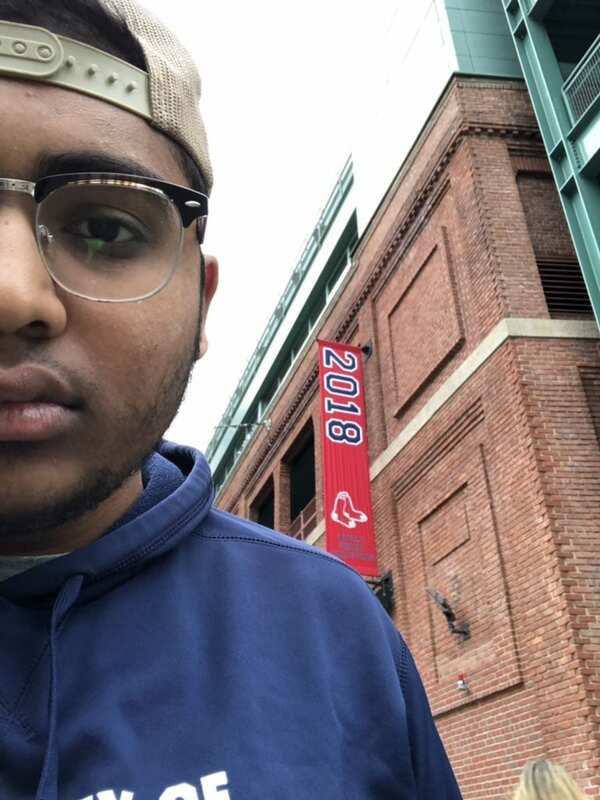 Congratulations to Akash Chinnasamy for being the first student to tweet a selfie from the November 2nd #FindMeFriday location! 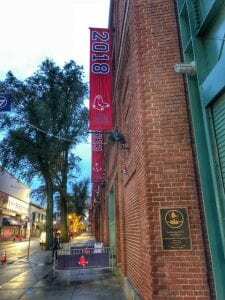 The first home of the Red Sox was on Huntington Avenue, the old Huntington Avenue Grounds. But in 1912, the Red Sox moved into their new digs Fenway Park, located at 4 Yawkey Way. Fenway Park is the oldest ballpark in Major League Baseball, but it is also well known for other reasons, like the Pesky Pole, the Green Monster, baseballs flying out of the park and smashing the windows of cars parked on the surrounding streets, and that little door that Manny Ramirez would disappear though during his time in the Red Sox uniform. Despite renovations and expansions, because of its cramped location in the middle of the city, Fenway is one of the smallest MLB ballparks, allowing less than 40,000 spectators the opportunity to enjoy a game from one of the very small, uncomfortable, and sometimes view restrictive seats…but that is all part of the experience of watching a Red Sox game live! The Red Sox experienced one of the longest droughts in the history of baseball after selling Babe Ruth to the Yankees. The “Curse of the Bambino” kept a World Series championship away from Boston for 86 years. But, in 2004, the Red Sox came back from being down 0-3 in the series against the Yankees and went on to sweep the St. Louis Cardinals in the World Series. Since then, they have brought home the World Championship three more times, including this past Sunday, October 28, 2018 when they defeated the LA Dodgers on the road. Whether or not you’re a Red Sox fan, it is hard not to be inspired by Fenway Park, the roar of the crowd on a clear summer’s night, the can-do attitude of the players, and the love that the fans have for their team. Catchers and pitchers report around February 13, 2019. Until then, the monster sleeps. Go Sox..and Go See Your City!